The peasants are revolting. Yes. It’s an old joke. But it wasn’t all that funny on May 30, 1381, the beginning of the Peasant’s Revolt, a.k.a. 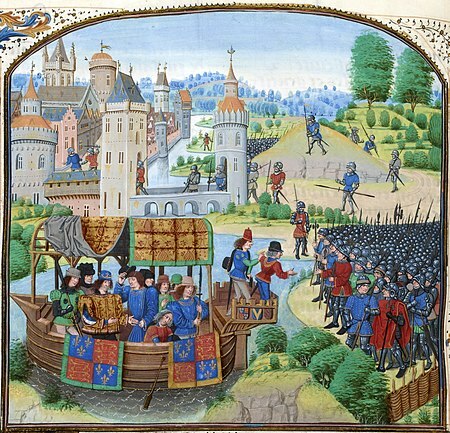 Wat Tyler’s Uprising, a.k.a. the Great Rising in England. It’s sort of a Massachusetts thing. What? There was no Massachusetts. They didn’t go in for peasant revolts. Whereof doth he blither? you ask. Of this. There is a remarkably stable pattern of regionally differentiated attitudes in Britain on everything from cooking to clothing to political and theological views, described in fascinating if sometimes excessive detail in David Hackett Fischer’s Albion’s Seed about the persistence of these folkways in America. I heartily recommend it for understanding important aspects of American history including the stuff happening now. On that basis, it’s not at all surprising that a major “left-wing” revolt like Tyler’s against the high and mighty in favour of equality would happen not in “England” as an undifferentiated entity but in the southeast, from which the majority of early settlers to New England came. Nor that the same part of England would be the hotbed of Puritanism and support for Cromwell-style radicalism in the English Civil War. Or, indeed, opposition to King John over Magna Carta. My own feelings on the matter are mixed. You couldn’t find a stronger supporter of Magna Carta outside Stephen Langton’s tomb. But the leveling impulse rapidly gets out of hand and sweeps away much that is vital along with much that is obnoxious. I’m no fan of Cromwell, and might have been persuaded in 1660 to dig him up, behead him and put the rest of his corpse in chains (they actually did that). But I’d also have voted to execute Charles I. I like my constitutions balanced. Interestingly, that’s more or less what came of the Tyler revolt. Initially successful, and spreading to the frequently turbulent cities of the North, it prompted a rare display of courageous statesmanship on the part of the young king Richard II including several meetings with the rebels one of which turned so ugly that Wat Tyler wound up dead and, as the cliché has it, with his head on a post. The revolt was soon suppressed. But then Parliament met, affirmed most existing laws, agreed that the king’s counsellors were a vile and worthless lot and needed changing, pardons were issued to almost everyone on all sides, the hated poll tax that triggered the revolt was abandoned, the expensive continental war was scaled back and landlords mostly avoided taking revenge on peasants except to a limited extent through the courts. In short, legitimate grievances were taken into account, severe reaction was avoided, and liberty under law was restored. (As for Richard, 18 years later he was deposed as a tyrant, and rightly so.) Even serfdom, a major sticking point for the rebels, quietly vanished in the next century. By the way, it’s not really clear that England had “peasants” in the standard sense. The common people were far richer even than their continental counterparts, and had far more legal rights. And while lots of nations have “peasants’ revolts” only England’s ends with a constitutional settlement. Oh happy land, whose colonies developed the same sorts of habits by getting people from all over the British Isles to balance their approach. Including the curious fact that the “radicals” in Watt Tyler’s revolt, and later in Massachusetts, hated high taxes. So did the conservatives. Another thing they found it easy to make peace by agreeing on, and another thing I love about Britain in its days of glory.